Battersea Bridge: this battered old crossing has survived more knocks and bumps than most supercentenarians. Awkwardly located at the head of a sharp meander in the Thames, it has proven a nightmare for navigators and even marine mammals. Here, we mark the bridge's history — in collisions. Battersea Bridge today. Photo by Sarah Chapman from the Londonist Flickr pool. The modern structure may be over 125 years old, but it wasn't the first crossing at this point on the Thames — it replaced an original wooden crossing informally known as Chelsea Bridge; itself the heir of a ferry service which had been nervously shuttling across that risky bend for centuries. Hastily thrown across the river in 1771, Henry Holland's whacking great timber structure crammed 19 arches into a relatively narrow stretch of river. Soon, this overpass was acting as a giant colander: letting through water but little else. By 1795, even Parliament had noticed that bridge was causing too many smashings and drownings, so some of the central struts were ordered to be taken out. The crossing thereby entered a near-perpetual state of ‘engineering work’: a Londoner’s bugbear then as now. Soon, this overpass was acting as a giant colander: letting through water but little else. As long as the deaths continued, so would the tinkering. Although its wealthy backers (among them an ancestor of Princess Diana) had endowed it with street lighting before the 18th century was out, the tolled crossing was roundly detested — and the infamous throat-slitting of Sarah MacFarlane on the walkway in 1844 put off travellers yet more. In its defence, the bridge had granted new access to empty marshland on the south side — of which industrialists availed themselves hungrily. Artists Turner and Whistler also found value in the old thing, painting it in moody tones. But the casualties persisted, and the Metropolitan Board of Works demanded Sir Joseph Bazalgette engineer a new solution. The improbable century-long reign of that flawed flyover swiftly ended in firewood. 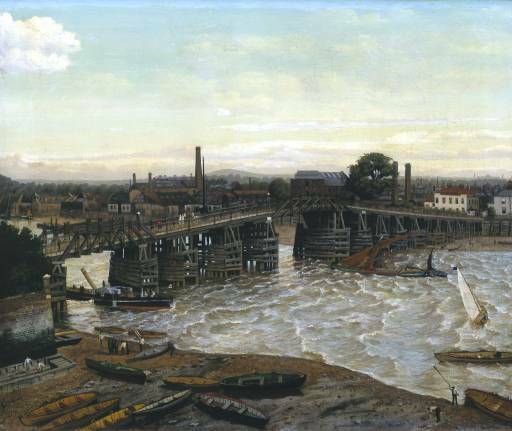 Old Battersea Bridge, 1874. Photo creative commons. Bazalgette’s five-span cantilever design is not an unbridled work of beauty, but in 1890 it at least appeared to have solved the 'colander' problem. Nowadays, the question is whether it still accommodates the modern vehicle — both above and below. At 12 metres wide, the current bridge at Battersea is London's narrowest. Whether in horse-drawn carriages, electric trams, or the modern car, drivers on the bridge have probably sought opportunities to hasten their passage across it. The result is a much-dreaded accident blackspot at road level as well as at river level. There were serious smashes in quick succession in 1948 and 1950. In the former, a sea captain was left trapped in his vessel for hours, but it was the latter instance which was particularly demonstrative of the hazardous transit faced by both river-farers and the motorists above. The hefty collision of 23 March — involving heavy winds and the John Hopkinson cargo ship — left the bridge hanging together by only the tram tracks. Once more it was closed off, and the tracks would never return. By the 1980s, ministers were trumpeting the fact that Battersea Bridge had sustained major damage on only "six occasions" in the 20th century. But late that decade, clumsy barges twice compromised the stonework, and calls to re-engineer the structure twice fell on deaf ears in favour of changing towing laws. In recent memory, the bridge faced yet another double whammy. 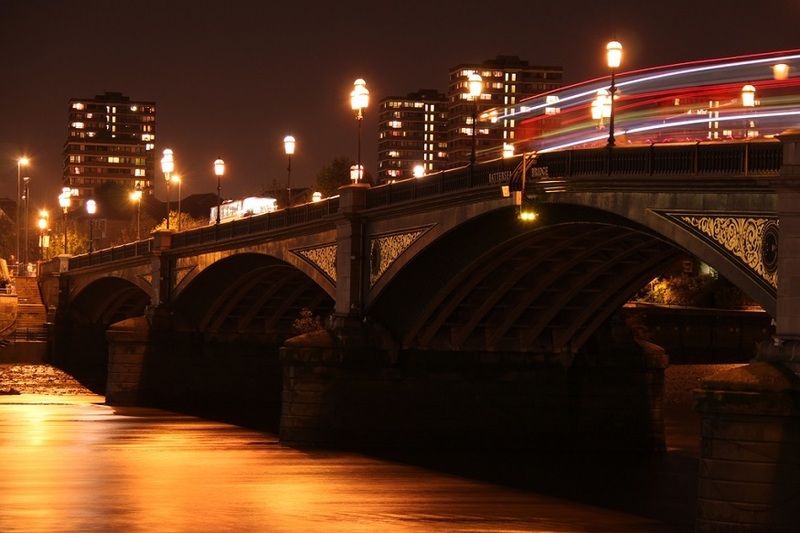 Closures brought about by the bridge's disagreement with a 200-tonne gravel transporter caused a four-month £500,000 headache for TfL, as well as repercussions across west London’s road network. Soon after reopening in 2006 it hosted the sad drama of the Thames Whale — a female Noethern Bottlenose which swam upstream as far as Battersea Bridge, where she got into difficulty and perished. It’s widely agreed that the problem with the Battersea Bridge is its location: it is the equivalent of a zebra crossing on a hairpin bend. Its history is overwhelmingly one of tragedy. But of all of London's bridges, there can be few that also signify positive connection quite like this one. Reconciling the genteel suburbs of Chelsea with the workman-like landscape of Battersea, the 'collision' for which this crossing really ought to be noted is the throwing together 125 years' worth of highly disparate cultures. Crash, bang, wallop: show us a drama that's run for longer.